The FiveHome Wifi range extender is well performance in expanding the coverage and improve the signal strength of an existing wireless network. Our Wifi repeater boosts your existing Wi-Fi coverage, extend wireless network to hard-to-reach areas. Clear WiFi dead zones simply! Farewell signal weak or broken, improve network strength, you just need a signal amplifier! The wifi extender only extends the wifi coverage range, BUT it couldn't boost the speed of your original router or hold the same speed of the original router. That means the wifi speed may be weakened compare with your router. 12-Month Warranty:We are manufactory which Specialized in network solutions for years.We supply worry-free 12-month warranty.If you have any question, please feel free to contact us via email. 【Expand Your WiFi Range】FiveHome Wi-Fi range extender works for expanding WiFi signal of main router to further rooms, completely covers network dead zones with stronger signal, optimize your home wireless coverage. 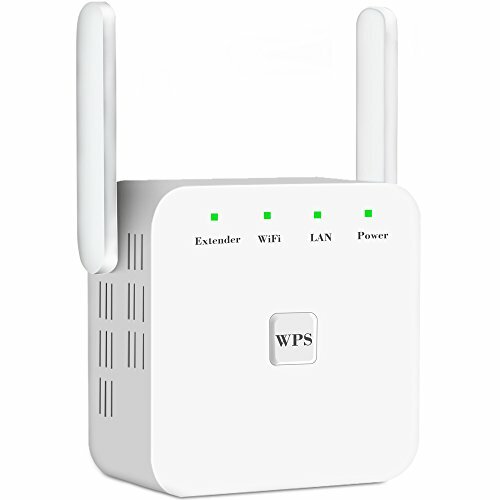 【WPS One-Button Easy Setup】WPS button supports "One-Press" connection and encryption, 96% customers can get it set up in 3 minutes!!! Plug and play, wall-mounted design with mini size, follow the user manual to set up easily, no complex steps and tech expert required. 【HIGH PERFORMANCE】 Support wifi signal extending through the wall; the extending distance can be up to 60m,the range could reach 100㎡,no more dead zones in your smart home life(speaker / monitoring / TV / doorbell / thermostat).2 External antennas for better performance, reliable wireless N network speed up to 300Mbps covering your bedroom, floors, restroom, garage and garden.